Lay ribs bone side up and remove membrane using a paper towel. 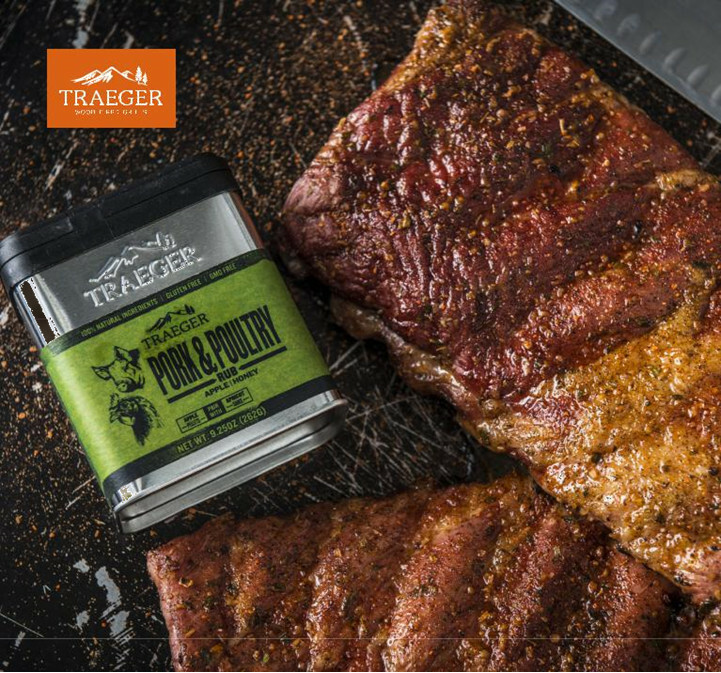 Season with Traeger Pork & Poultry Rub and allow to sit at room temperature for 30 minutes, or refrigerate wrapped in plastic wrap overnight. Place ribs on grill bone side down and cook for 1.5 to 2 hours or until internal temperature reaches 160 degrees F when an instant-read thermometer is inserted in the thickest part of the meat not touching the bone. Once 160 degrees F is reached, place 4 Tbsp butter on a double layer of heavy duty foil large enough to create a packet for each rack of ribs. Place ribs meat side down over butter, 4 Tbsp per rack. Add 1/4 cup grape juice and seal each foil packet. Place foil packet back on grill and continue to cook at 250 degrees F for 1.5 to 2 hours or until an instant-read thermometer inserted in the thickest part of the meat (not touching the bone) reads 195 degrees F.
Remove from grill and allow to rest for 15 minutes before slicing. Enjoy!